Javan Rusa (cervus timorensis)Kingham Safaris is famous for its huge rusa and looking at the SCI record book it’s easy to see why. 11 of the top 12 (including number 1) in the typical category and 9 of the top 10 (including number 1) in the non-typical category. Appearance: The larger of the two rusa, the Javan rusa is a medium sized deer with a coarse grey-brown coat. Antlers: 3 points per side with the second tine on the outside of the main beam. Trophy size: Antlers have been recorded as long as 39 inches, though a mature male will average 33-35 inches. A good representative trophy scores around SCI 145. 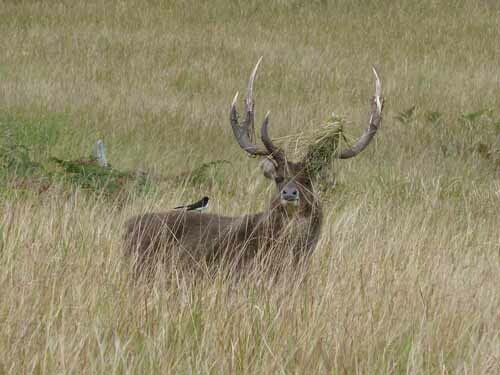 History: Javan rusa were first introduced into Australia from Indonesia in 1868. Hunting rusa in Australia: Javan rusa have a clearly defined rut in June/July. During the rut they make a vocal roar with the occasional elk-like whistle. Battles between roaring stags can be vicious, with serious wounds inflicted. In the rut they will “tail” a female. Before and after the rut they gather in small bachelor groups. They feed in open or lightly forested country. With the hilly terrain we mainly spot and stalk.